I'm planning to do a cosplay for Death Note but I wanna switch things up a bit. How do I make my own Death Note rules and put them on the "How To Use" black rules page? I wanna make my own rules someone please help me. Last edited by basantee on 04 Jan 2013, 07:35, edited 1 time in total. You want to know how to create your own Death Note image to print out? Basically your problem is going to be printing white ink on to black, which I'm not sure is possible! 1. Create a graphic with a black canvas & white font (like this) and just print it out on to white paper (so the paper becomes black with ink, but it probably won't be a deep black & you're going to use a shitload of black ink). 2. Download a Death Note font pack (like this) and print white text onto white paper (with black outlines), then grab some scissors and cut out the white text & stick that text onto a black piece of paper. 3. Same as #2, but instead of cutting out the white text, simply paint the white page (that the text is printed on) black. 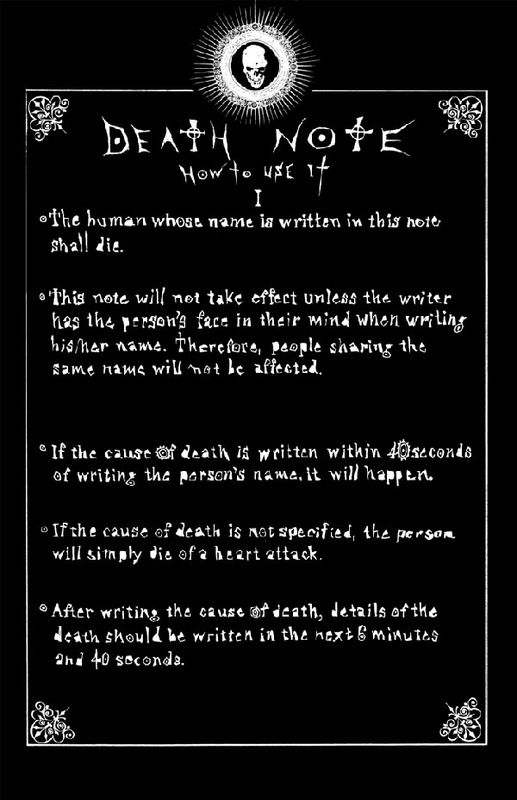 Shingster wrote: You want to know how to create your own Death Note image to print out? Basically your problem is going to be printing white ink on to black, which I'm not sure is possible! I'm sure the spambot will be thankful.